I think some might be shorted who usually get one. I thought you’d enjoy seeing this antique chip carving. Look closely to see how the chips were removed to develop the pattern. I have three copies of the newest Woodcarving Illustrated, Winter 2016, that I’m giving away! Please only post an answer to ONE question. NOTE: If one of the questions is already answered correctly by someone, don’t answer it again! You have to be the first to answer a question correctly to win. If you see an answer by someone that you believe is incorrect, then go ahead and post your answer. What Store item was the November video and pattern created for? What is the first name of the person at MyChipCarving who answers the phone, ships your packages and answers a lot of your questions? What year was MyChipCarving founded? 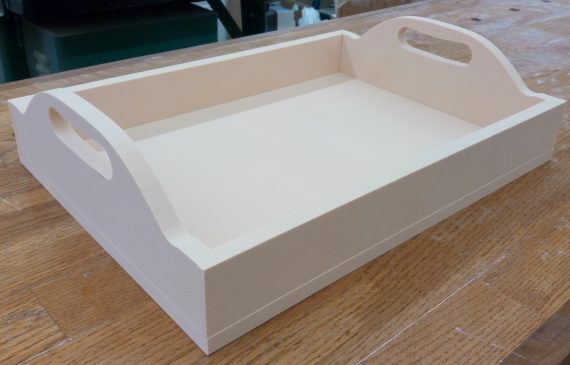 Recently I was asked about the availability of a basswood serving tray. I’ve made them in the past and knew that they were time consuming to make. So instead of basswood I suggested EZboard as the perfect material. It is water resistant so spills and clean up will be a snap! Look for a pattern and sample carving coming soon at EZcarving.com. Sign up for the ezcarving Blog if projects like this interest you. More info on the Serving Tray can be found HERE.